If we’re being honest, we all know that we love brunch a little bit too much, right? Between brunch and avocado buying we’re all apparently never going to be homeowners (because that’s totally the reason…). But if that’s to be the case, brunch might as well be delicious, mightn’t it? Brunch is a glorious thing, and I love making it on a lazy weekend. Whether I’ve friends coming over or I simply decide of a morning that a treat is in order for no real reason, brunch is on the cards. For ages it’s been a pretty standard affair – it’s been banana pancakes, peanut butter pancakes, or sometimes bacon and avocado toast – but flicking through cookbooks, Instagram and the like I’ve been thinking about upping the brunch stakes. 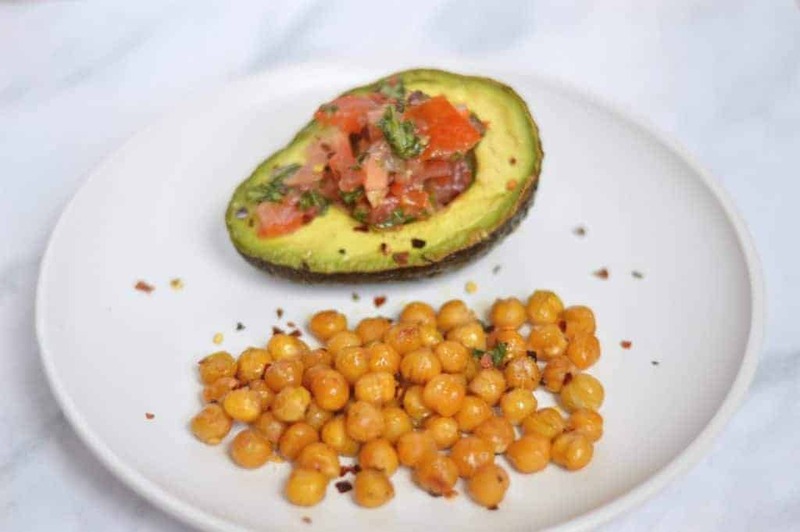 And this baked avocado with chilli chickpeas does just that. Not only are avocados delicious when they’re mashed up fresh, but they bake like a dream as well. When you bake an avocado it takes all that smooth texture it has and somehow makes it into something even dreamier. It also works if your avocado isn’t quite as ripe as you thought it would be by the weekend – which is an added bonus! 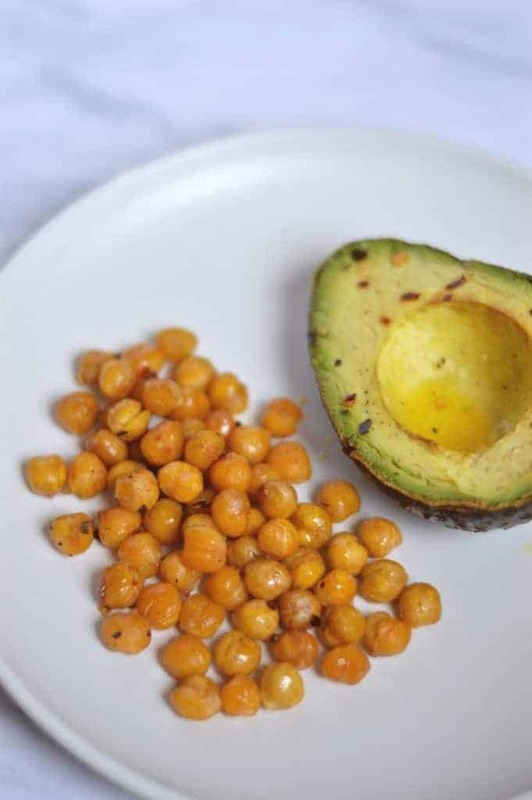 Add in to the mix the earthy flavours of some roasted chickpeas and the heat of the chillies and you get a dish that brings multiple layers and flavours to your morning. Oh, and it looks rather good on the plate too, don’t you think? As if you needed more reasons to tuck in to this recipe, it’s also pretty healthy for a brunch recipe. Mainly being fruit and legumes, it’s full of goodness that you might perhaps not get from a stack of bacon and maple syrup pancakes (but you don’t eat those for the health benefits, so it’s totally fine). It’s not going to entirely undo whatever debauchery you were up to the night before, but it’ll be pretty good for you in the long run and is going to impress whoever you are sharing your brunch with. This is a brunch recipe that goes above and beyond what you might normally think of making, but it’s well worth the extra bit of effort, especially if you are sharing it with someone else. Rinse your chickpeas off in a colander to get rid of any of the brine and pat off the excess moisture with a piece of kitchen roll. Half your avocado and remove the stone. 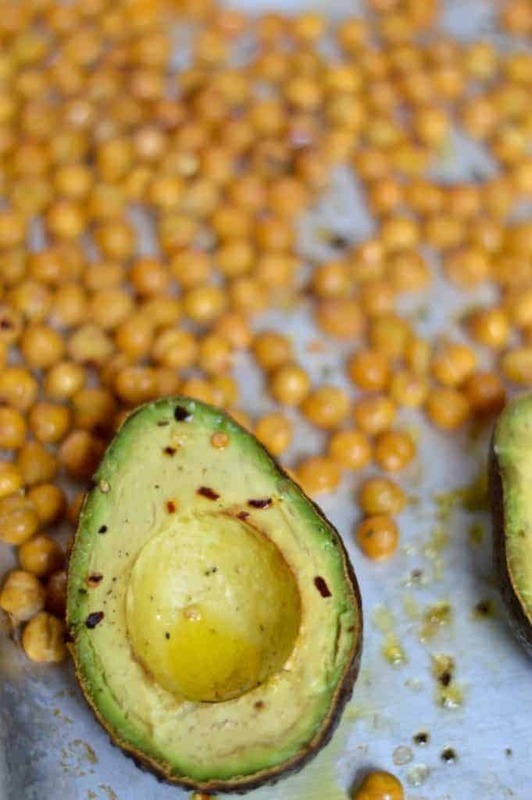 Scatter the chickpeas on a baking tray and put the avocado halves face up in the middle. Drizzle over the olive oil and scatter over the chilli flakes along with some salt and pepper. Gently shake the tray so that the chickpeas are lightly coated in the oil and that everything is in one layer. Bake in the centre of the oven and bake for about 25 minutes (or until the chickpeas are golden brown). Whilst the avocado and chickpeas are baking, make the salsa by finely chopping the tomatoes, coriander and spring onion. Add in the lime juice, some salt and pepper and mix together (I did all this in a mini chopper). 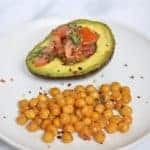 When the chickpeas are ready, serve up half an avocado filled with salsa and a couple of spoons of chickpeas for each person, and enjoy. If you’re not a coriander fan, then parsley will work just as well in this recipe.